The Three Rs: Rants, Raves and (Occasional) Reflections: "I'm Going to be Late...There's a Moose at My Door...."
"I'm Going to be Late...There's a Moose at My Door...."
Yesterday was The Big Day. 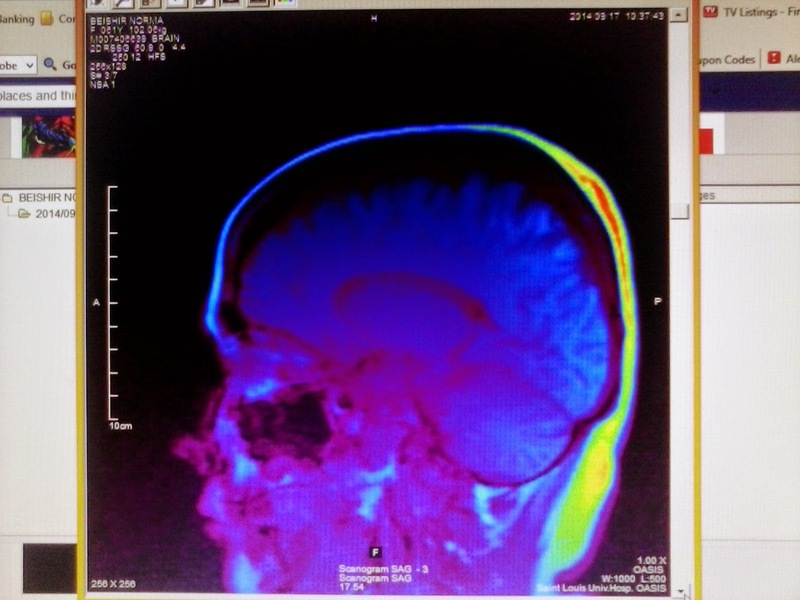 For those of you who didn't think I had a brain in my head, I give you, in living color...my brain! After I endured twenty hours without sleep, Carolyn and I were off to St. Louis University Hospital for my tests. I was prepared. I hate hospital gowns, so I chose clothing that was comfortable and without snaps, buttons, zippers or anything else that might be problematic for a test that's done with magnets. I took along a towel and a small bottle of shampoo to wash my hair after the EEG, which uses a gooey substance to attach the electrodes to the scalp. I'd just gotten my hair cut and figured that would make the electrode attachment easier. I wanted the tests to be done as quickly as possible--Carolyn and I were going to the IHOP where Collin works for lunch afterward. Then they brought me a wheelchair. My EEG was done by a very entertaining technician named Charles, who told me about his experiences moving around the country. He'd lived in Alaska for a time and said it was not at all unusual to see moose walking down the streets. (Anyone who saw William's photoblog yesterday saw how majestic a full-grown male moose looks.) Well, the hospital where Charles worked had a large atrium full of greenery at the entrance. One day, a hungry moose entered the hospital through the electronic doors, had lunch in the atrium, then left! He said he once had to call in to inform his employers he would be late--because there was a moose at his door who refused to leave! He said a 150-pound man versus a 1500-moose just wasn't going to happen! Carolyn, in a waiting room next to the lab, was trying to figure out why I was laughing. I do enjoy a good moose tale. After my EEG was done, I went into the bathroom, washed my hair, and was immediately taken to the MRI department. I assured the young woman from patient transport that my hair would be dry before the next test even got started--and it was. It's short, it's baby-fine--and it dries fast. No blow dryer needed. There's a huge sign on the door to the MRI lab: red and white, reading "DANGER." That's comforting. The machine itself is called Oasis. It's anything but an oasis. I was told I wouldn't be able to see the images while it was in progress, but I could have a CD to take home once it was done. I didn't get a copy of my EEG. Charles said it would be about 150 pages. I never thought to ask for a computer file...maybe my doctor will give me one. 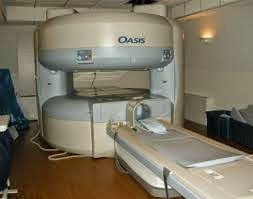 I'm extremely claustrophobic, so rather than knock me out, Dr. Yi Pan, my neurologist, ordered an open MRI. I was in the hands of the skilled (and extremely patient) Lisa and Kim, who got me positioned on the table, made sure I was comfortable, and explained the procedure to me. It would take about twenty-five minutes and would be very, very, very, VERY noisy. If I moved or stopped the procedure for any reason, they would have to start all over again. I was determined that wasn't going to happen. Once would be quite enough, thank you very much! A mask-like device was placed over my face and earplugs in my ears. The mask, I was told, would take the pictures of my brain. Then, they placed something in my hand that felt like a joystick. It was a call button. I was to press it if I needed help. I'm too young to die...oh, wait a minute. Too late to use that excuse. What's that brushing against my cheek? Can I scratch it? A nap might make this go faster. Go to sleep. God, get me out of this and I promise to always behave myself. Yes, I know You've heard that one before. But this time I really mean it. Oh, that's right--You've heard THAT before, too. Think about something else. Anything else. If I don't finish, I won't get the CD. No photos of my brain for our Christmas cards this year. I really want that CD. At least this is more interesting that the dumb soap opera I'd be watching if I were at home. Start plotting the next novel...and hope you can remember what you come up with by the time you can write it all down. Just as I was about to give in to panic and push the button,the machine stopped. Lisa and Kim came back into the room and rescued me. I was wobbly when I first stood up, so getting back into the wheelchair was, in my opinion, a great idea. A few more minutes to wait for my CD, and I was done. Yay! I haven't touched alcohol in years, but I felt like I was drunk. I still do. I got some rest, got some sleep last night (though not enough), but I'm still not back to normal. It may take a few days, I don't know. I hope it only takes a few days. 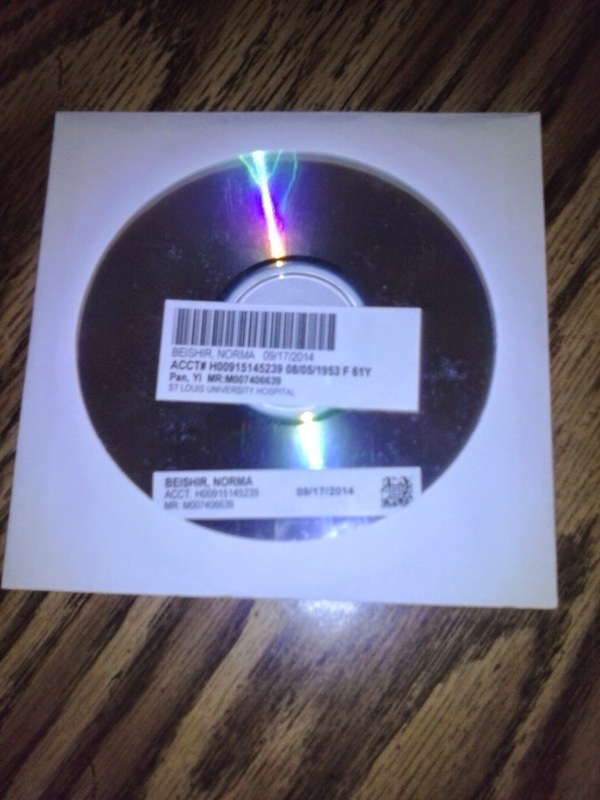 Last night, Collin opened the files on the CD and we got a look at my brain for the first time. In spite of having spent a lot of time looking at "abnormal" MRI brain scans online, I still don't have a clue what to watch for on my own. It looks pretty normal, actually. Since we still haven't figured out how to save individual images, I had to settle to photographing a few with my phone for use here. I haven't heard from my doctor yet. I got a message in My Chart (SLU's online medical chart) this morning. Excited, thinking it was my test results, I couldn't wait to open it. It was a flu vaccine reminder. Rats! Wow. You are so brave. I would have gone for some sleep-aid. Btw, that last photo must have some plot scenario going on because I see a 44 Magnum on the left side of your brain. Lol and hugs. Hah! The funny thing is that I had been told I only had a right brain because I don't seem to have any left-brained skills! Great running commentary. I hope you catch up on your sleep. The first scan I had like 30 years ago was horrible. lights going off and on I had a migraine for 5 days after. The last few I had have been somewhat better. Mostly because I could have a pillow under my knees. They don't care about my knees and all the metal I have have in them. I remember when the panic came up I promised myself that I could press the button after I counted to 10. Then I counted 20. Panic set in then I would count to 10 again. I visualize each number. But if the scans come out fine and all Is OK I think you should slap on some holly and use one as a Christmas card ! 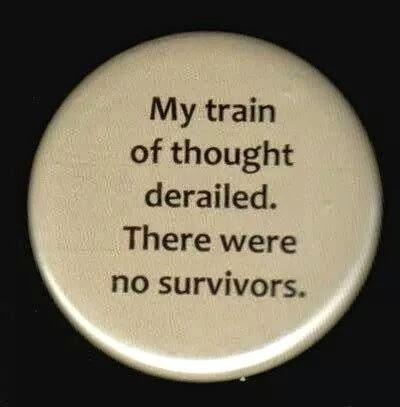 And that is how my brain works ! I think what kept me going was that I wanted to know, once and for all, what's going on in there. I was diagnosed epileptic when I was a teenager, but all of the EEGs have been inconclusive as to the specifics. Anesthetics are hard on the body, so I decided I wanted to be awake. I'm thinking about having Collin photoshop a Santa hat on one of the images--if we can ever figure out how to save them! The program used to open them is seriously weird. Goodness what a fabulous idea ! Those machines aren't fun! I always think I can't go one more second without screaming/flailing around/falling off the bench. So far, I've been able to endure. Glad you were able to, too! I think all of these medical diagnostic devices were invented by the Marquis de Sade--mammograms, colonoscopies, endoscopies, MRIs, I'm talking about you! Yes, whatever that is in there does look like a gun! I've never had this sort of thing done, so I don't know how I'd react, but closed spaces hasn't been an issue for me. I can imagine that the whole thing would end up having you feel out of sorts afterwards. You'd have an issue with this closed in space. It's really loud. Yes, I just told Collin I felt like I was drunk yesterday and I feel hungover today. Some of the images from the MRI looked like somebody had made my brain very angry! Holy wow. That's one not so fun, but also interesting kind of day. How was iHop afterward and what did you girls get? We had their classic breakfast crepes: scrambled eggs, white cheddar, ham and bacon, topped with a white cheddar sauce and green onions. They were delicious! 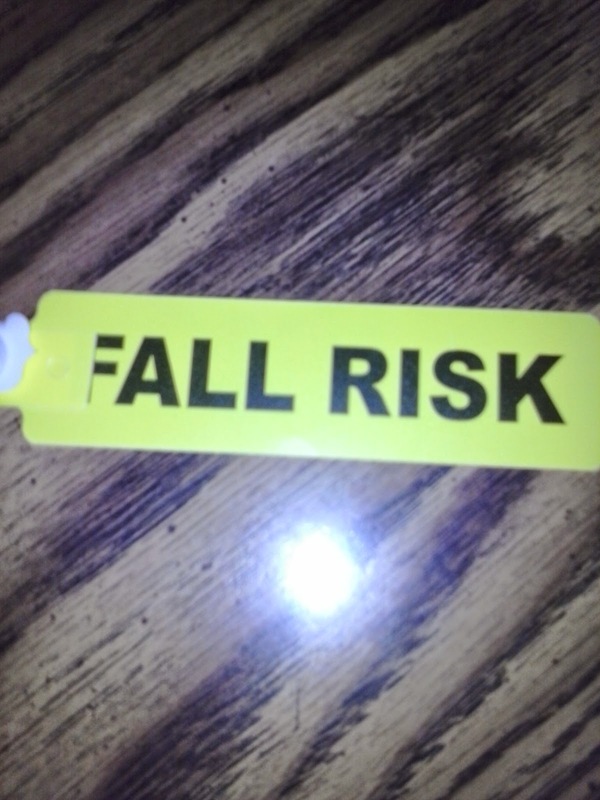 "Fall risk", "danger", and an I need help immediately button...they don't make it easy, do they? Glad it's done with! I'm glad it's over...but I am glad I had those three doing the testing. They sure don't focus on 'customer experience,' do they? Maybe Amazon should get into the medical imaging business. I don't think it's possible for those tests to be pleasant, but I was in good hands all the way. p.s. I couldn't find where you saw the hackers on my site? It never fails, Grace. There's always an itch when we can't scratch. I haven't heard from my doctor yet, but she has hundreds of images to look at and 150 pages of brain waves. I'm going to assume no news is good news until I hear otherwise. I'll take a look again. The spammer on your blog was just above one of my comments. 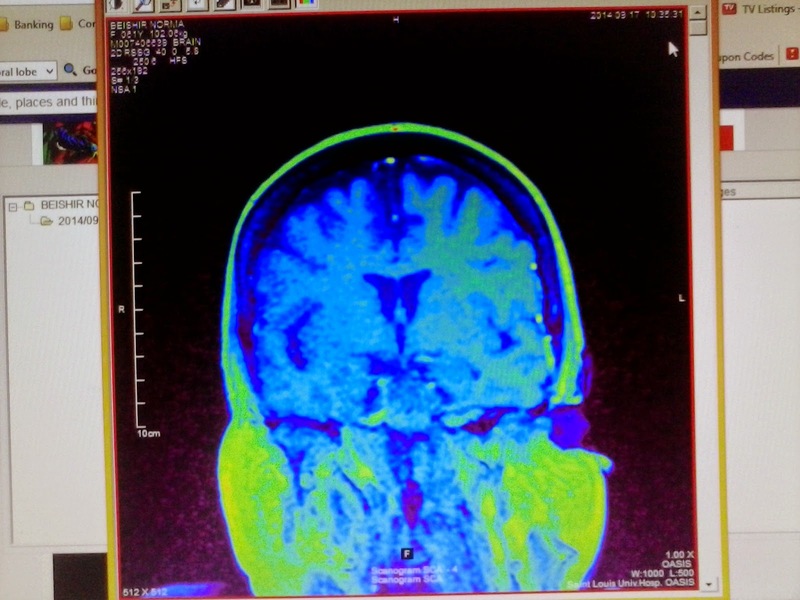 I've had both an EEG and MRI. Being inside the MRI tunnel was the most terrifying thing I've ever done besides riding in a Ferris wheel. I am extremely grateful to my doctor for ordering an open MRI. No way could I have done the regular kind unless I was completely unconscious! No problem with Ferris wheels, though. What an experience!! Novel or short story waiting to happen;). Your brain looks normal to me--at least compared to the normal brains in the charts I've seen on TV! Hope all results are good--sending hugs and prayers your way:). I'm starting to have regrets about admitting publicly to having some brain issues. Some people find it funny to ask me stupid questions, like what I mean when I say I bought a loaf of bread.